Also known as kava-kava, ava pepper or ava root, the kava plant (Piper methysticum) is a medicinal plant from the Pacific Islands. The root of the plant is used to make a ceremonial drink called kava drink which is praised for its relaxing effects. Research on the properties of the root reveals it has impressively potent anxyolitic and sedative effects, hence its use for ceremonies in the Pacific Islands and growing popularity as a natural anti-anxiety treatment in Western populations. There are several cultivars of the kava plant. The different varieties distinguish themselves from one another by their content of biologically active constituents in the form of kavalactones. More kavalactones means the plant has stronger medicinal effects, but is also more likely to cause side effects. Less kavalactones means the plant has a more mild effect and is thus safer to use. The age of the harvested root is also an important indicator of the lactones content of future preparations as roots younger than five years will most likely have less active constituents. What does kava look like? The Piper methysticum species is a shrub-like plant with multiple lean, knobby stems and large, green leaves. The stems of a mature plant are greenish-brown in color with small, rounded, dark-colored protuberances along them. They are somewhat similar in appearance to bamboo stems, but with more pronounced, less regular protuberances. Lateral stems are common and produce leaves at the end. Main stems also produce leaves. The leaves are heart-shaped and large, pointy towards the end, with veins starting at where the leaf is connected to the stem (the base) and branching out in arc-like patterns (also called arcuate venation). The more mature the leaf, the larger it is. In some varieties, the plant stops producing leaves while it flowers. During the flowering process, existing leaves grow to considerable sizes. Kava flowers have a stick-like appearance and a whiteish color. Surprisingly, they do not produce seeds and thus do not play any part in the reproduction of the plant. Instead, the plant is propagated through cuttings: sections of the stem are planted either horizontally or vertically in the ground and new plants emerge from them. But for the propagation to be successful, the sections of stem should contain at least one node (protuberance). The plant thrives in warm, humid climates with plenty of rainfall, but requires partial shade and a well-drained soil (the root is very absorbant and thus prone to molds). The root of the plant has a dirt-brown or grayish-brown skin and whiteish interior. There are two types of root withing the same plant: crown roots and lateral roots. Crown roots are rod-shaped and bulkier than lateral ones which have a more fibrous appearance and grow somewhat along the ground. The lateral roots have the most economic importance as they are the main source of active constituents. Kava plants produce substantial amounts of root material, provided they are given time to grow. The older the plant (preferably at least five years old), the bigger, longer and more substantial the roots. What does kava taste like? The roots have an earthy, but bitter flavor to them, for some reminiscent of bitter coffee grounds. Other people find they taste like dirt. The flavor is difficult to mask, but making kava drink with fruit juices or coconut milk or water may help improve its taste slightly. Overall, it is an acquired taste. Kava roots are the only part of the plant safe and suitable for human consumption that can be used medicinally. The leaves and stems are thus not edible, nor do they hold medicinal benefits because they have been shown to contain a very low content of kavalactones. Moreover, the stems and leaves contain toxic compounds and are thus dangerous if ingested. The roots can be used either dried or fresh (preparations from the fresh product are stronger). They can be grounded into a fine powder, shredded or made into an extract, all forms being suitable to make kava drink. How to make kava drink? The traditional beverage can be made by pressing the freshly harvested root to obtain its juices. Another more commonly used method is to place the kava extract, shreds or powder into a strainer or cloth strainer and steep it into water, milk or a fruit juice. The active constituents will leak out of the root material into the liquid. The longer the root material is soaked into liquid, the higher the final concentration of active constituents will be (and technically the better the drink). It is recommended to use cold or room-temperature liquids to draw out the constituents in the root or maximum lukewarm liquids. Cold pressing is also a good method. It appears kavalactones are heat sensitive and hot liquids may inactivate their properties. So kava tea is more likely kava maceration. Moreover, it would appear the active constituents are best extracted with the help of fats, hence the recommendation to use milk instead of water or fruit juices, or add some milk or vegetable fat to the water or fruit juice. Biologically active constituents in kava root. 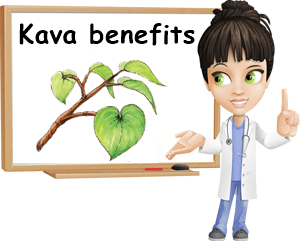 The main elements in kava responsible for its health benefits, but also adverse effects are kavalactones (meaning lactones from kava). They have been found to possess anxyolitic, sedative and analgesic properties and may improve mood and cognitive function. However, kavalactones have been shown to inhibit certain liver enzymes which is why they are believed to cause hepatotoxicity and other adverse effects. However, research appears to indicate the side effects of kava preparations stem from the way the root is prepared in view of extracting is active constituents. 1) Anti-anxiety activity. Research shows kavalactones possess excellent anxyolitc effects and regular consumption of the root can efficiently reduce anxiety and its symptoms. However, effects may differ from cultivar to cultivar and adequate doses need to be established by a medical professional for each individual case. You can read more about alternative anti-anxiety herbal remedies here. 2) Improved mood. Those who make use of kava report enjoying almost euphoric states and an overall improvement in mood and disposition. Indeed, the active constituents act as muscle relaxants, relieving tension, and on the nervous system, altering brain chemistry, hence the improvement in disposition. 3) Insomnia relief. Kava appears to not only relax, but also exert a mildly sedative action. The two effects combined can relieve insomnia and help restore restful sleep. Moreover, as a result of its muscle relaxant effects, the root is said to help improve sleep quality. The same properties that help with sleeping problems may prove useful for managing hyperactivity as well. 5) May help with depression. Despite conflicting research, there are studies that indicate kava may help with symptoms of depression. However, it does not represent a treatment proper for the disorder, but merely a complementary therapy. Again, different varieties of the plant and different preparations may vary widely in terms of efficacy. 6) Holds sedative properties. Kavalactones in the root have been shown to possess sedative and mildly analgesic properties. As a result, preparations of the plant may be directed at the treatment of muscle tension, stiffness, minor aches or pains of different sorts, restlessness and stress relief. It is important not to exceed recommended doses because the root can cause sleepiness and interact with routine activities such as driving or operating machines. 7) Positive effects on cognition. It has been suggested that root preparations may enhance cognition as a result of the way the active constituents alter brain chemistry. One possible explanation for this is the noradrenaline re-uptake inhibition effect of kavalactones. The evidence for the medicinal use of kava is conflicting, with studies showing it is beneficial for various mental disorders and studies showing it may cause hepatotoxicity and other adverse effects. It is believed that kava is not regarded as a good choice for the treatment of anxiety and other mental disorders due to its high toxicity risks which discourage consumption. The root is a very potent herbal remedy and exceeding recommended doses even by very little can augment its effects to the extent it becomes risky for one’s health. 1) Liver toxicity. The active constituents in kava have been found to alter liver function and become toxic for the organ. However, not all kava and not all types of preparations are reported to do so. It has been suggested that extracting the active constituents in the root with the help of chemical solvents or alcohol solutions may negatively impact liver function. Soaking the root in cold water, choosing safe cultivards, reputed brands and not exceeding recommended doses is said to help prevent such outcomes. The traditional preparation method is said to be safe because water also helps extract glutathione from the root, a compound believed to have a hepatoprotective action when included in the preparations (Kava lactones and the kava-kava controversy). People with existing liver problems are advised to avoid the herb altogether. However, it has been speculated that pure kava root from selected cultivards does not cause liver problems, but rather the presence of aerial parts such as stems or leaves in the products contaminates them causing hepatotoxicity. 2) Interactions with medicines. 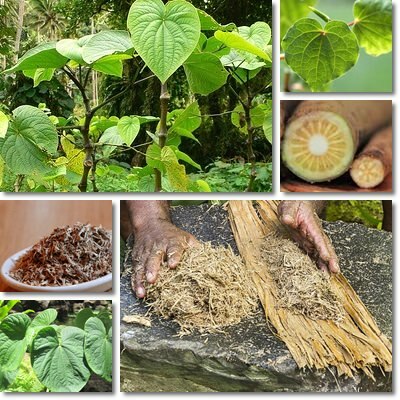 Kava has been found to interact with various medicines such as sedatives, antidepressants, anti-anxiety medication, anesthetics, medicines meant to treat liver damage and support liver function. It is important to ask your doctor whether or not kava is safe for you if you are taking any prescription medication. 3) Interacts with alcoholic beverages. Kava may yield hepatotoxic effects when combined with alcohol, which is why it is recommended to restrain from consuming alcoholic beverages if you are taking preparations of the herb. Moreover, alcoholic beverages may enhance the sedative effects of the herb and cause excessive sleepiness. 4) Skin rash. There have been reports kava use may cause inflammation and lead to dermatitis or dry, scaly skin. This may be a result of a hypersensitivity to compounds in the root. Yellowing of the skin and nails has also been reported, as well as temporary swelling. 5) Other. Exceeding recommended doses even by very little can cause drowsiness so it might be best not to drive if you feel sleepy. It can cause stomach pain or digestive upset. Kava is also currently unsafe for use during pregnancy due to the lack of research on its effects on fetal development. It is also not recommended for children.